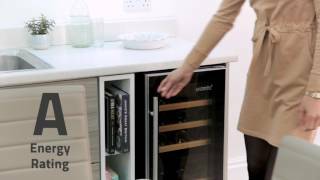 If you’re looking for purpose designed wine storage, the HUS-ZY3-D-NS-26 Signature Wine Cooler is made just for wine lovers at home. This compact 380cm wide wine cooler is ideal for restricted spaces and is suitable for undercounter or free standing use, yet its slide out wooden shelves still swallow up to 26 x 75cl bottles and chills them to perfection. At 875mm high, it slots under any kitchen worktop and also looks great in the dining room. Touch screen digital controls allow wine enthusiasts to chill different wines at two totally different temperatures, all monitored by dual LED displays. The upper zone cools up to 15 bottles at any preferred temperature between 5-12°C, whilst the lower zone will store 11 bottles between 12-22°C. 142kWh per year, based on standard test results for 24 hours. Actual energy consumption will depend on how the appliance is used and where it is located.